Da Volterra, a biotechnology company located in France, is developing breakthrough therapies to protect the intestinal microbiota during antibiotic treatments. DAV132, an absorbent-based product, is its most advanced Phase 2-stage asset, that is designed to prevent C. difficile infection (CDI) for at risk human patients. 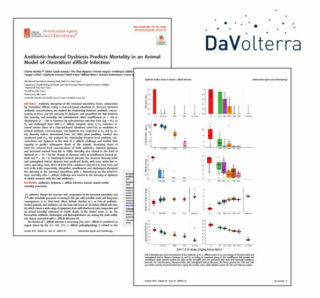 A recent publication by Da Volterra in Antimicrobial Agents and Chemotherapy shows that the product prevents CDI related death in hamsters when given in combination with each of the antibiotics moxifloxacin or clindamycin. Mortality was demonstrated to be correlated to the intensity of dysbiosis, and the product prevented CDI by protecting the diversity of the intestinal microbiota. Burdet C, Sayah-Jeanne S, Nguyen TT, Hugon P, Sablier-Gallis F, Saint-Lu N, Corbel T, Ferreira S, Pulse M, Weiss W, Andremont A, Mentré F, de Gunzburg J. 2018. Antibiotic-induced dysbiosis predicts mortality in an animal model of Clostridium difficile infection. Antimicrob Agents Chemother 62:e00925-18.